Has anyone else experienced extremely cold weather lately? I'm normally a fan of cold, winter weather, but when I can barely go for a 5 minute walk to my car without having my hands numb, it's a bit excessive. Somehow this past weekend I survived standing outside for a ski jump. If you saw me, you probably thought I was wearing the most unfashionable outfit wearing layers, upon layers, and not to mention my boyfriends sweatpants over top my jeans. At least I could say I was warm...for about 10 minutes. Once we stood in front of the fire, I was content though. Plus the hot coco peppermint schnapps helped a bunch! I've never been to a ski jump before, so I was pretty impressed with the show. Let me tell you, those men can fly! I have to say, I was a little disappointed editing these photos. All of my favorites were out of focus or I blinked. Plus it was cold, so I didn't take a lot to begin with...oh well! That's winter in Wisconsin for ya! Is this not the cutest top you've ever seen!? 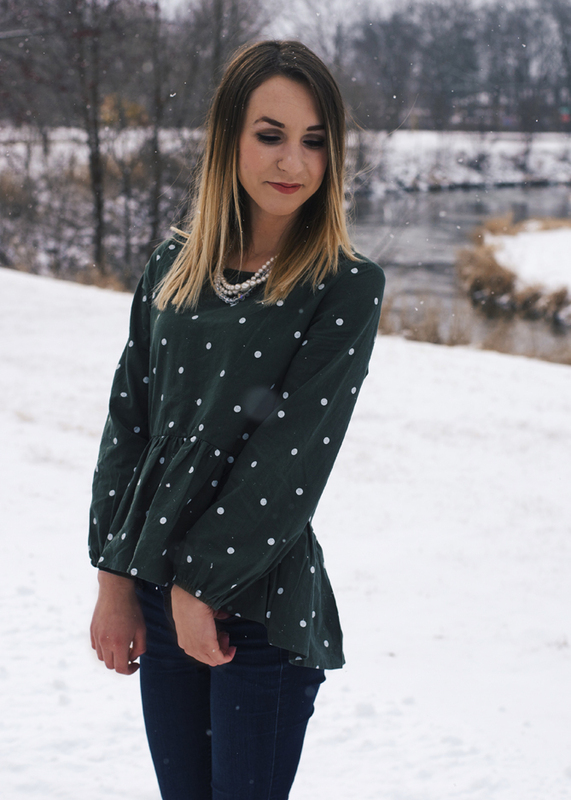 Polka dots is by far my favorite print of all time! It's just so feminine and girly. Believe it or not I don't own any green clothing. I'm not sure why because I think it looks great with my hazel eyes and ombre hair. Guess I won't get pinched now on St. Patrick's Day. I love the slight peplum hem and the puffy sleeves. 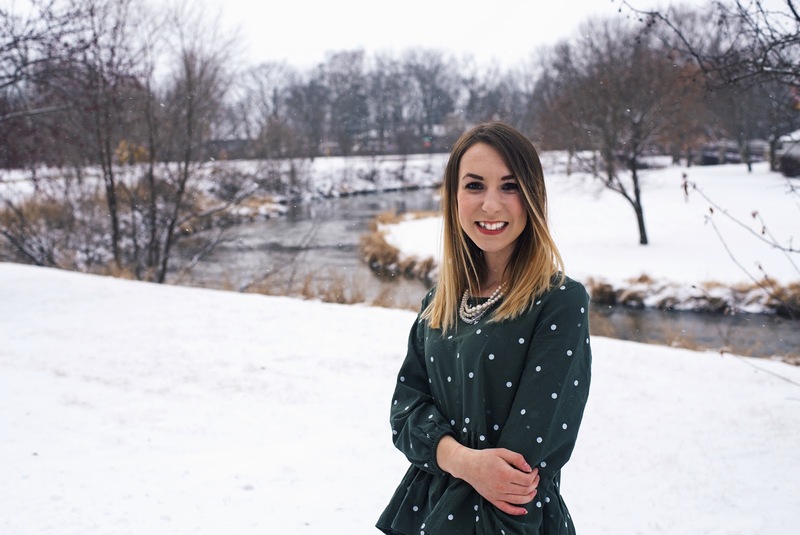 Back in high school I was obsessed with the dramatic peplum hem with the peterpan collar. Anyone else remember that? I love how this peplum is less dramatic. This is the kind of top you can dress up or down. Best of all, it's incredibly comfortable which is what I'm all about right now. This is such a lovely look! 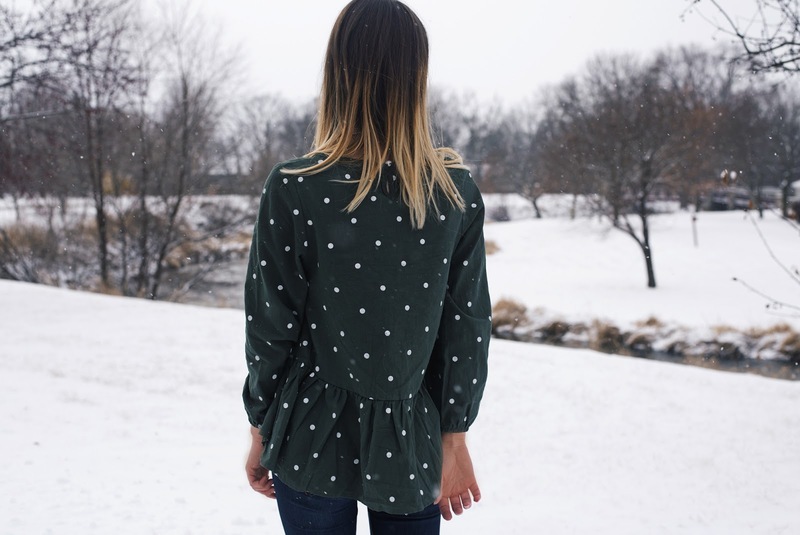 You really can't go wrong with classic prints like polka dot, it never goes out of style. I love the elegance of the top dear, looks absolutely pretty on you!